DesBarres Manor receives the 2008 Cuisine of the Year Award at the Taste of Nova Scotia Prestige Awards. From a special vintage for a once-in-a-lifetime celebration, to everyday wines from around the world, our Proprietor's wine list complements the Manor's East Coast cuisine. Our fireside dining room is a cozy spot to savour our fabulous inn breakfasts. Join the Chef for a fun Nova Scotia cooking class with our Girl’s Food & Wine Girls and Cooking Class Getaway packages. Wes, there are the awards for the DesBarres Manor Inn Restaurant – seven consecutive Wine Spectator Awards of Excellence, Nova Scotia's Cuisine of the Year and twice on the Canadian Wine Annual's Where to Eat & Stay in Atlantic Canada. But the dining experience at DesBarres Manor Inn remains authentic and East Coast relaxed. Our cuisine tells stories of our people, history and special place by the sea, a vast bay that has been attracting visitors for more than 400 years. Simple, direct and honest food that captures the flavours and traditions of our Nova Scotia region while giving a nod to the global village we find ourselves in today. Our seasonal menus take inspiration from our local fishermen and farmers as well as the organic gardens where we plant vegetables and herbs for our restaurant. We invite you to take a table by our 1837 hearth fireplace or, in the summer, walk through the French doors to dine on our deck and gazebo looking over the peaceful grounds. The DesBarres Manor Inn restaurant is open to both guests of the inn and the general public and is open throughout the year. Dinner reservations are required. Culinary getaway packages are available. You can read more about our special dining packages here. In addition to our main dining room, the Inn has a secluded private dining room to accommodate groups of up to six, perfect for your most special occasions. DesBarres Manor Inn’s commitment to create the best culinary experience Nova Scotia has to offer is reflected by our membership in Taste of Nova. 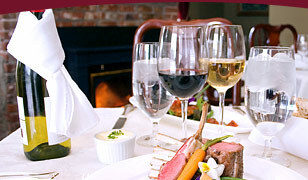 Exceptional East Coast cuisine, fine wines and warm Maritimes hospitality. More reasons to make DesBarres Manor Inn your Nova Scotia Eastern Shore dining getaway. Bring the great tastes of the DesBarres Manor Inn kitchen into your home with recipes your family and friends are certain to enjoy. From food and drink magazines, to gourmet shows, our culinary team is turning people on to modern Canadian cuisine with a regional Nova Scotia influence. These are some of the delicious recipes that have appeared on our seasonal daily menus. Sign up for the DesBarres Manor Inn e-newsletter to be the first to get new recipes from our Chefs. Taking its name from the location of the famous Cape Breton Island distiller Glen Breton, this delicious cocktail is the true taste of summer in Nova Scotia. Combining Glen Breton whiskey, strawberries, fresh garden mint, Nova Scotia maple syrup and lime, the Cape Crusader has been delighting guests in the Parlour Room cocktail bar this summer. Bringing together the taste of the Atlantic Coast with the harvest from the garden, this light and fresh recipe is simple to make. Paired with an inexpensive Viognier, this is the perfect dish for easy and elegant entertaining with friends. For the Occasions Magazine Summer Tasting Menu, DesBarres Manor Inn prepared a refreshing “Maritime Martini” with Digby scallops as a perfect first course for a summer party. This special salad with an icewine dressing was created for the May Wines of Nova Scotia newsletter. Simple to prepare, the fresh flavours of this unique salad make it a winning first course for a relaxed spring dinner. We share a wine pick from the Manor cellar to accompany this easy spring recipe. This memorable rack of lamb recipe was created for the fall issue of Boom Magazine. Matching lamb from Guysborough County with a savoury coulis and a confit of wild Nova Scotia blueberries and beets from the Manor’s organic garden, this recipe brings together the local flavours that helped make DesBarres Manor the 2008 Cuisine of the Year. We share our wine picks to accompany this special recipe. The subscribers’ only exclusive recipe in our summer e-newsletter was Grilled Atlantic Halibut Stuffed with Fennel and Pine Nuts. Prized by Chef’s for its delicious firm white meat, we regularly feature Atlantic halibut during the summer months as fishing boats come in with their catch. Served with a simple green salad, this easy recipe the perfect dinner for special occasions as the fennel and pine nut stuffing makes an elegant statement on the plate. Our cellar keeper shares some our favourite wines to match the stuffed halibut. The subscribers’ only exclusive recipe in our Spring e-newsletter was Pan Seared Sea Scallops with Lime Cilantro Slaw. The light flavours and easy presentation make this recipe perfect for care free entertaining on the summer patio as well. Our cellar keeper paired the flavours of the scallops and slaw with two delicious whites. The subscribers’ only exclusive recipe in our fall e-newsletter was Sweet Potato Soup with Nova Scotia Maple Syrup and Garlic Chives. Sweet potato soup is a great cold weather classic and we brought together Nova Scotia Maple Syrup, a touch of brandy and fresh garlic chives from the Manor’s garden to create a delicious soup that is certain to delight your dinner guests. We paired the flavours of the soup with two fabulous wines. In a recent issue of DesBarres Manor News we featured a recipe for Smoked Salmon Bread Pudding after receiving a request from an enthusiastic guest. We’re pleased to share the complex flavours of this savory pudding and our Innkeepers wine picks with you. DesBarres Manor Inn was invited by Occasions Magazine to share our secrets for cooking with wine and prepare some special recipes using wine that reflect his unique East Coast approach to contemporary Canadian cuisine. The results were fantastic. DesBarres Manor turned on the taste buds at the Savour Food & Wine Show and again on ATV’s Breakfast Television with this fabulous recipe bringing together the traditional Nova Scotia fish cake with amazing Asian flavours. We offer our wine picks to help bring out the intense flavours of this dish. Matching beef with warm salads reflects the Manor’s relaxed, yet elegant approach to food, perfect for a celebration or a special evening with friends or family. We offer her wine picks to match your occasion. DesBarres Manor's contemporary Canadian cuisine with an East Nova Scotia Lobster Cakes with Mango Rhubarb Salsa DesBarres Manor's contemporary East Coast cuisine was featured in the 2006 summer issue of Occasions magazine when Manor's culinary team brought together Nova Scotia lobster with a salsa of local rhubarb and Asian flavours to create a memorable lobster cake. The people at Occasions teamed the cakes with the fabulous flavours of Conundrum, perfect for a relaxed, elegant evening. Would you like to receive more recipes? Sign up for the DesBarres Manor e-newsletter with recipes, wine picks and special offers and events. Click here to join.